The Perrenoud, built in 1901, is just one of several historic buildings in the Swallow Hill neighborhood. The larger neighborhood was first known as the Park Avenue Addition, established in 1874; the development of Swallow Hill did not begin until 1886, with the majority of the structures built between 1888 and 1893. The name came from the developer of one portion of the neighborhood: Banker George R. Swallow. 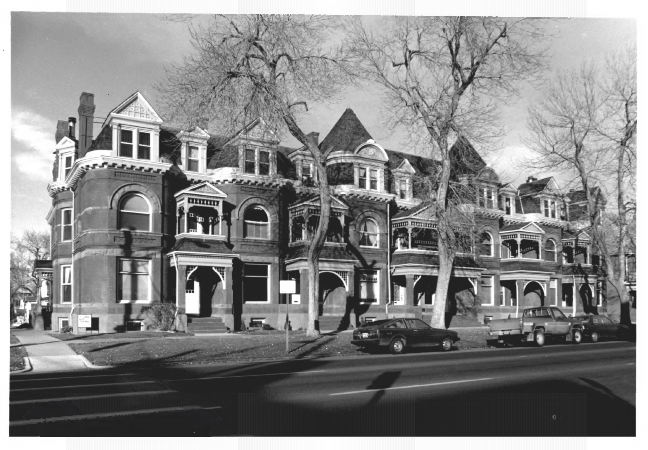 Swallow Hill was placed on the National Register in the late 1980s, but it was not added to Denver’s list of landmark districts until more than a decade later. The boundaries differ, and there was much discussion about which structures would be in or out of the local district. There was no discussion, however, about whether the Perrenoud would sit at the heart of this district, even though it was constructed after the bulk of growth happened in Swallow Hill, and after the turning point year of 1893. That the rush to build here ended in 1893 is no surprise: Denver and the West were hit hard hit economically by the Silver Crash of that year. The repeal of the Sherman Silver Purchase Act knocked silver off its throne in Colorado, where mining was a major industry. High-living ended, and the look of Denver’s neighborhoods did, too. 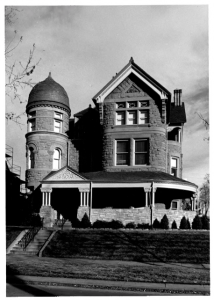 Much of Swallow Hill is high-style Victorian in design, with Queen Anne a particularly popular style in synch with Denver’s bullish economy in the 1880s. But after 1893, people pulled in their horns (and pocketbooks) when it came to the level of elaborate decoration they wanted (or could afford) on their buildings. Though the Perrenoud’s interior is luxurious — marble steps and sections of walls, mirrors, a sweeping tile floor and the stained- and painted-glass atrium skylight — on the exterior it is a more conservative (if eclectic) neo-Classical structure. In the past decade, new construction has been a continual neighbor in Swallow Hill, and though many of these projects are quite forgettable, a few stand out as worthy members of the community. Most prominent in this category are the Swallow Hill development on Emerson and Clarkson streets designed by David Owen Tryba. Other locations in Swallow Hill are more of the era before the 1893 crash. Here are a few notable buildings near the Perrenoud, though for a full list of all structures in the Swallow Hill Historic District on the National Register, check out the Colorado Historical Society website (coloradohistory.org, then office of archaeology and preservation, then program areas), or for Denver’s list of designated structures, go to denvergov.org, and the landmark commission page, to access district maps and building lists. 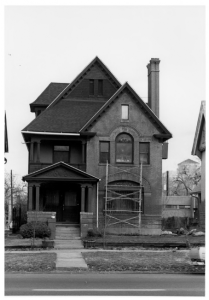 The Bailey House was built the same year, but designed by William A. Lang and Marshall Pugh. The sweeping veranda shows Lang’s love of working in stone, and the stylistic elements include imposing bargeboards, a turret, and a crested roof. In all, a Queen Anne structure with Romanesque overtones, in a home that successfully morphed into an office building. 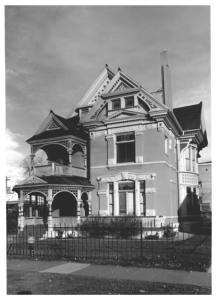 The Flower-Vaile House was built in 1889 to a design by the firm of Balcomb and Rice. An ornately decorated Queen Anne structure, it takes its name from owner John Flower. 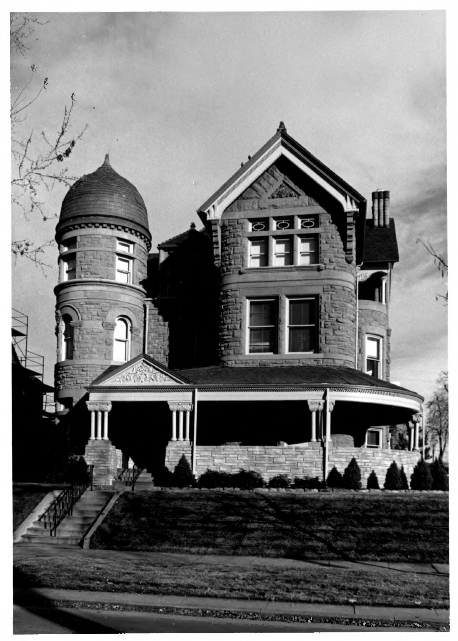 Architect Frank Edbrooke (Denver Dry Building, Brown Palace Hotel, Oxford Hotel) is represented by several buildings in Swallow Hill, including his own residence at 931 E. 17th Ave. Built in 1889, the Edbrooke home is a tidy, almost unprepossessing Queen Anne of brick and sandstone characterized by arched windows and beautiful detailing. The Grafton Apartments are another jewel of the neighborhood, designed in 1890 by architect James Murdock. Built as six three-story townhouses, the place was known as the Aldine Family Hotel when it was new, but was later operated as apartments and renamed the Grafton. 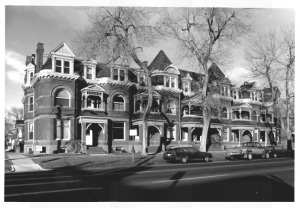 It was converted into more than 20 condos in the late 1970s, one of the first condo conversion projects in North Capitol Hill. Its design — mansard roof, elaborately differentiated facade bays, and plenty of gingerbread — make this one of the neighborhood’s most exuberant historic structures.